Pax Earth has formally launched phase-II of W2L project for the underprivileged farmers at Kot Timal village, Namobuddha Municipality-5, Kavrepalanchok, Nepal on June 28, 2017. The population of the village is about 650 (129 households). The entire village has been suffering from a huge scarcity of water be it for drinking, cooking, feeding cattle or irrigating farmland. To ease their pain to some extent, we launched phase-I of the W2L project to help create or maintain the plastic ponds to harvest rainwater. We provided Silpaulin (plastic) sheets to 129 families to replace the old and worn out Silpaulin sheets or to dig a new one. These plastic ponds provided access to more water particularly for cattle rearing and household use, and to some extent for homestead garden. Considering the encouraging outcomes of the phase-I, we have launched the phase-II to facilitate tunnel farming aided by drip irrigation system. For this, we have selected 10 farmers and provided each with one set of the Silpaulin sheet and drip irrigation kit. 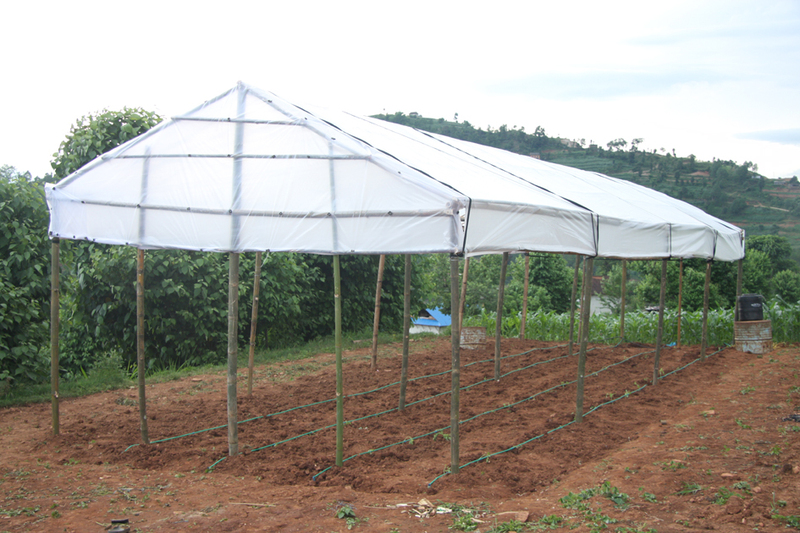 The Silpaulin sheets will be used for roofing the tunnels while drip irrigation kits to facilitate irrigation. Full report is presented below. Pax Earth had executed the Mission Education and Environment Project (MEEP) at three schools – Shree Raktakali Primary School, Shree Kalika Primary School and Shree Seti Devi Primary School located in Namobuddha Municipality (then Kanpur VDC) of Kavrepalanchok from June 2010 through March 2017. The objectives of the project were to contribute in education, personal hygiene and environment of the underprivileged students and the schools. While connecting to the community people on a regular basis, the members of the organisation has been well-aware that the community people have been suffering from a huge scarcity of water for over a decade be it for drinking, cooking, cleaning, cattle farming or irrigation. One of the reasons that encouraged us to start the MEEP was the scarcity of the water in the Kot Timal village. The community people preferred their children go to fetch water, look after their siblings or cattle, or work in the farmland rather than sending them to schools. On one hand, we knew that implementing any project to avail more water in the village would require billions of rupees which was beyond our capacity. On the other, we felt for the children who were compelled to deprive of basic education. After our several efforts, we could convince the parents to send their children to the school. We elucidated the importance of education in life and assured to reduce their economic burden to some extent by offering stationery. Finally, they accepted our offer to provide all necessary educational materials to their children. Accordingly, we launched the MEEP and executed for 7-years and contributed in the education and personal hygiene of the underprivileged children as well as to promote clean and green environment in the schools. It would not be an exaggeration if we say that the scarcity of water has impeded the village from all possible developments. Even though the village has a huge potential for tourism, it is not possible to exploit the opportunity just due to the lack of water. In each visit during the execution of the MEEP, the community kept on asking us to do something to resolve the scarcity of water problem to whatever extent possible. We were searching for the possible options and funds to do something to increase the availability of the water in the village. We even attempted for deep water drilling project and others but none of the projects could be implemented due to a lack of budget and technical know-how. Agriculture and farming have been the major sources of livelihoods for the community in the Kot Timal village. They used to grow corn, wheat, barley, millet, soybean and a few vegetables for home consumption and involved in cattle rearing for milk and meat purpose. They could sell the livestock and surplus milk and maintain the livelihoods as well as send their children to school for basic education. There used to be adequate water resources for daily household consumption and rearing cattle in the village. Even the irrigation to their farmland was possible to some extent. However, with the passage of time, the sources of water were slowly drying up. When the motorable road linking the village to the markets in Banepa and Kathmandu was constructed, they were motivated towards commercial farming and started to cultivate cash crops such as tomatoes, peas, beans, cucumbers, cauliflowers and eggplants. Over the years, the drying up of the available sources of water started to hinder their attempts for commercial farming. Even they started to suffer for drinking water. To ease their pain and suffering, then Kanpur VDC office initiated a campaign – “one house, one pond” in the village to support them create a plastic pond by offering Silpaulin plastic sheets 6 years back. Most of the households could make a plastic pond, harvest the rain water and use in cattle rearing, household tasks and vegetable farming. However, with the passage of time, the Silpaulin sheets started to wear out and they could not store rain water in the pond like before. As a result, they found it difficult to rear livestock and many families were compelled to sell them as it became unaffordable to keep them paying a high price for the water brought from the rivers down the hills. In addition, they could not irrigate their kitchen garden. 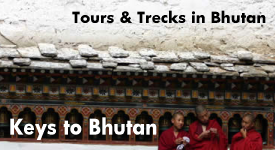 Due to these, many families migrated to other villages and urban areas particularly to Banepa and Kathmandu. The massive earthquake and aftershocks in 2015 added to their woes by drying up two natural sprouts. From one sprout, they could get reduced water approx. 20 litre per day per family which was used for drinking. And for all other purposes they did buy water paying upto Rs. 2 per litre transported through rivers down the hills. The shortage of water impeded the community from exploiting agricultural and farming potentials. To support in their energy and ease pain, Pax Earth developed a low-cost model incorporating rain water, plastic pond, drip irrigation system, cattle farming and tunnel farming based on value-chain analysis. The model starts with rain water collection to the plastic pond. This water would benefit the farmers in two folds – i) cattle farming and ii) tunnel farming aided by drip irrigation system as presented in diagram 1. The villagers can use the water in rearing their cattle for milk and meat. Similarly, the water can help in producing high value crops in a large quantity in off-seasons to cater a higher price in the market. Ultimately, the model helps to improve incomes and thereby to improve livelihoods. Hence, we turned this model into a project named “Water to Livelihoods (W2L) project. 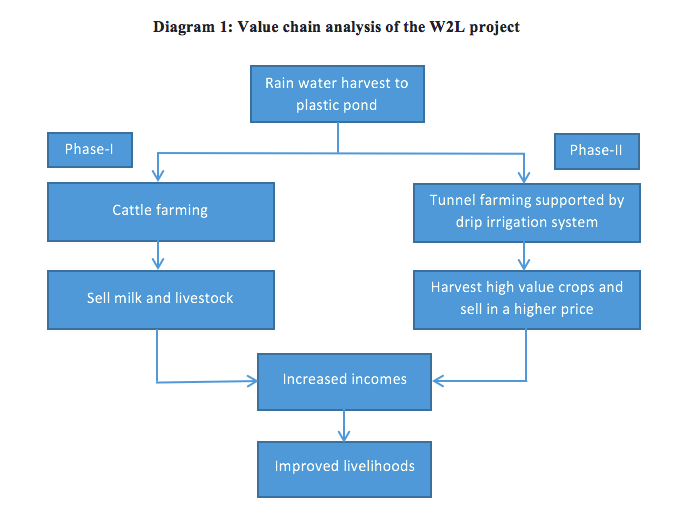 We present two value chains dividing the W2L project into two phases. The staff of the World Bank Nepal Country Office liked our project idea and agreed to provide fund and the community people were ready to participate economically. With the initiative of the Pax Earth, economic participation from the community people and the financial support of the staff of the World Bank Nepal Country Office, we could raise fund for implementing phase-I of the project. On May 12, 2016, we distributed Silpaulin sheets (size 24ft by 30ft with 120 GSM thickness) to 129 farmer households (approx. 650 community people) to replace the old worn out sheets or to dig a new pit. Although most of the households did have a pit to harvest rain, 10% dug the new pits. 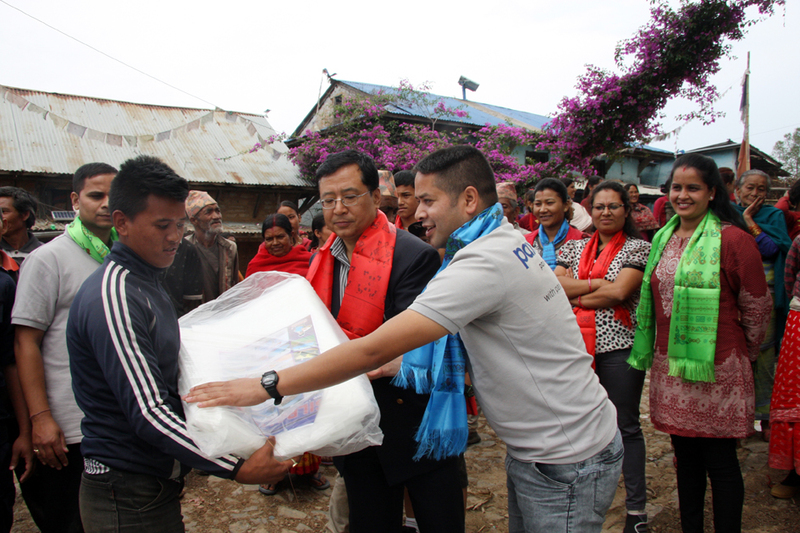 The World Bank Nepal Country office Sr. Operations Officer Bigyan Pradhan and Pax Earth Nepal President Sujan Koirala jointly distributing a Silpaulin sheet to a farmer in Kot Timal village. These plastic ponds have a capacity to store 25,000 litre to 30,000 litre of rainwater good enough for rearing few cattle, household use and small homestead garden. If there is a normal rainfall in the regular interval, they can harvest and store at least 25,000 litre of water throughout the year which is adequate to rear a few livestock and irrigate farmland connected to the plastic ponds. They can easily secure a monthly income of Rs. 10,000 to Rs. 15000 just from selling milk. Hence, these plastic ponds contributed to improve their incomes through increased milk production, livestock farming and agriculture. The water can be used in washing clothes, bathing and cleaning contributing to improved sanitation. In addition to these benefits, over 20 new houses were built in Kot Timal village after the earthquakes utilizing the water in the place of earthquake-destroyed houses. Hence, the benefits of the plastic pond are manifold. 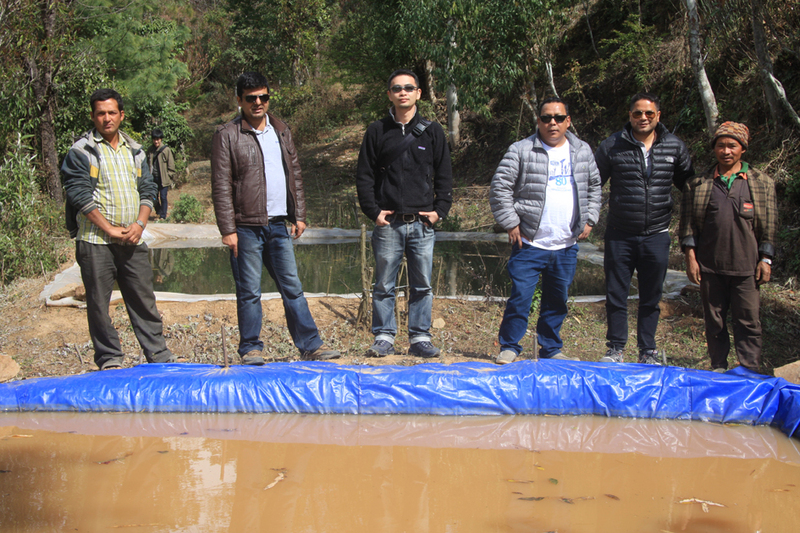 Pax Earth team is inspecting the plastic ponds in Kot Timal village. Pax Earth had experimented this model at a farmer’s house in Kanpur village in Kavrepalanchok for the first time in 2015/16 and extended in 2016/17 as well. In FY 2015/16, the farmer could harvest 850 Kg tomatoes from 100 seedlings and sold them at a price range in between Rs. 20 and Rs. 25 per Kg. He planted the seedlings in July 2015 and harvested from September 2015 through December 2015. Experiment of tunnel farming using drip irrigation system at a farmland in Kanpur village. The result was even better in 2016/17; the same farmer could harvest 680 Kg tomatoes and 175 Kg cauliflowers. He planted 100 tomato seedlings in May 2016 and harvested 680 Kg tomatoes in July 2016. Further, he planted 100 cauliflower seedlings in last week of August 2016 and harvested 175 Kg cauliflowers in last week of November 2016. He could sell 650 Kg tomatoes at an average price of Rs. 30 per Kg while 150 Kg cauliflowers at an average price of Rs. 70 per Kg. Result of the tomato cultivation in tunnel using drip irrigation system in Kanpur village. With the set-up of the plastic pond in each house and considering the encouraging results of the experiments of the tunnel farming supported by drip irrigation system, Pax Earth conducted a workshop on drip irrigation system to orient the farmers in Kot Timal village on March 14, 2017. Including six women, 25 farmers actively participated in it. A drip irrigation technology expert from Sital Drip Irrigation Technology Industry conducted the workshop incorporating both on-the-field and off-the field sessions. 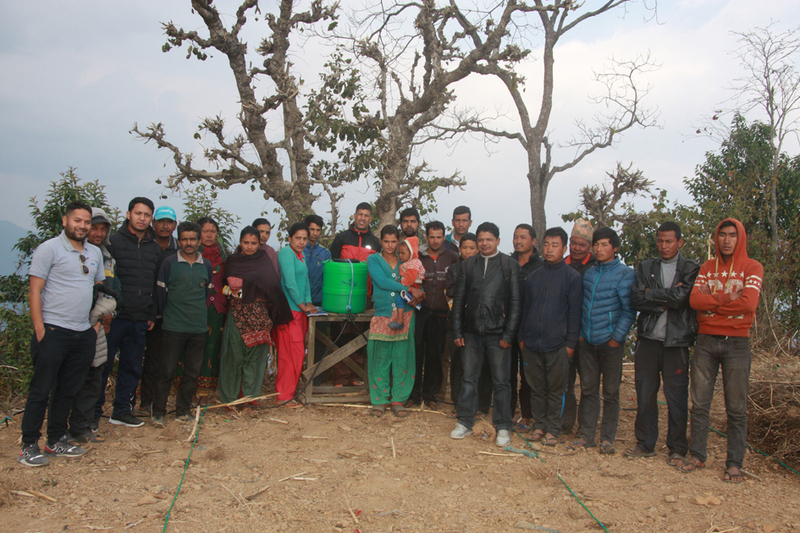 All the participants realized that the tunnel farming supported by drip irrigation system is an appropriate low-cost technology for cultivating higher value crops in the water-stricken Kot Timal village. Group photo after drip irrigation workshop in Kot Timal village. After the successful implementation of the phase-I of the W2L project along with the encouraging results of the experiments and positive outcome of the drip irrigation workshop, we have launched the phase-II of the project on June 28, 2017 by handing drip irrigation kits and Silpaulin sheets to 10 farmers to facilitate tunnel farming supported by drip irrigation system. These 10 farmers were selected from the drip irrigation workshop participants (see a brief profile of the farmers in table 1). We handed high quality Silpaulin sheets (size 6m x 12m with thickness of 90GSM) and drip irrigation kits (5 lines) with a capacity to plant 100 crop seedlings. The drip irrigation kits are manufactured by Sital Drip Irrigation Technology Industry after extensive research and development over two decades in Nepal. The important feature of the kit is easy to install and operate. The beauty of this project is the economic participation of the farmers. Each farmer has contributed Rs. 1500.00 for this project in addition to creating bamboo tunnel structure and field for plantation on their own. Some of the farmers have already planted the tomatoes seedlings while others are prepared to plant. We expect that they will finish plantation till the mid-July. We should wait for the next three months to observe the results. 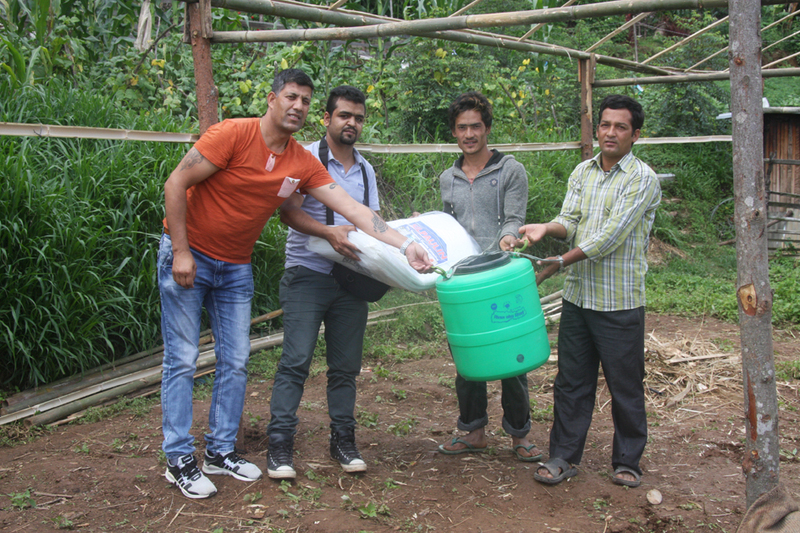 Pax Earth Members Kapil Deuja and Sital Mainali distributing a drip irrigation kit and a Silpaulin sheer to a farmer in Kot Timal village. 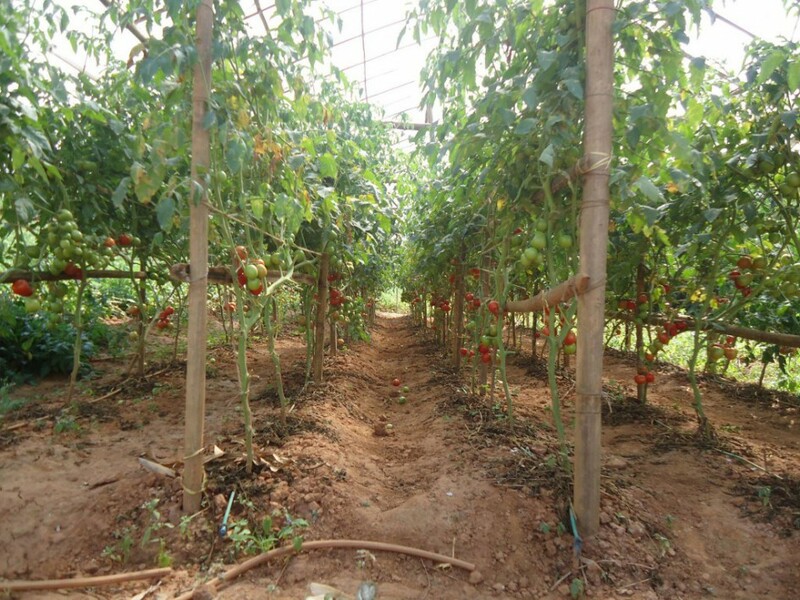 The tunnel farming with drip irrigation system helps to cultivate high value crops such as tomatoes, cucumbers, cauliflowers, bitter guards, capsicums, egg plants, pumpkins and beans particularly in off-seasons and can cater a high price in the market. This farming technique provides high yields and more returns. The important benefit of the drip system is ability to control water supply. The water goes directly to the roots of the plant hence they can supply in whatever quantity is needed. In addition, the water-soluble fertilizers and nutrients can be directly supplied to the plants through drippers. This system extends harvesting time by 2 to 4 weeks. The quality and quantity of the crops produced in tunnel farming are far better than produced outside. The tunnel offers shelters from wind, hail and insects and can reduce disease pressure as well but the Silpaulin sheets can be damaged by strong wind and snow. Hence, the farmers should be quite attentive to protect them from these potential risks. This system not only increases crops production but also helps in saving costlier inputs particularly time, effort and cost. 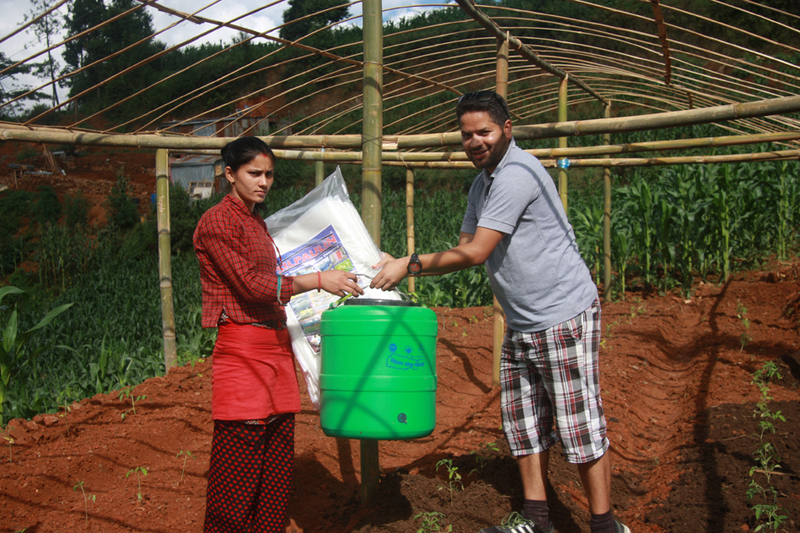 Pax Earth Member Kapi Deuja distributing a drip irrigation kit and a Silpaulin sheet to a farmer in Kot Timal village. This project is sustainable as it does not require additional maintenance cost but need a good care of the Silpaulin sheets and drip irrigation kits. 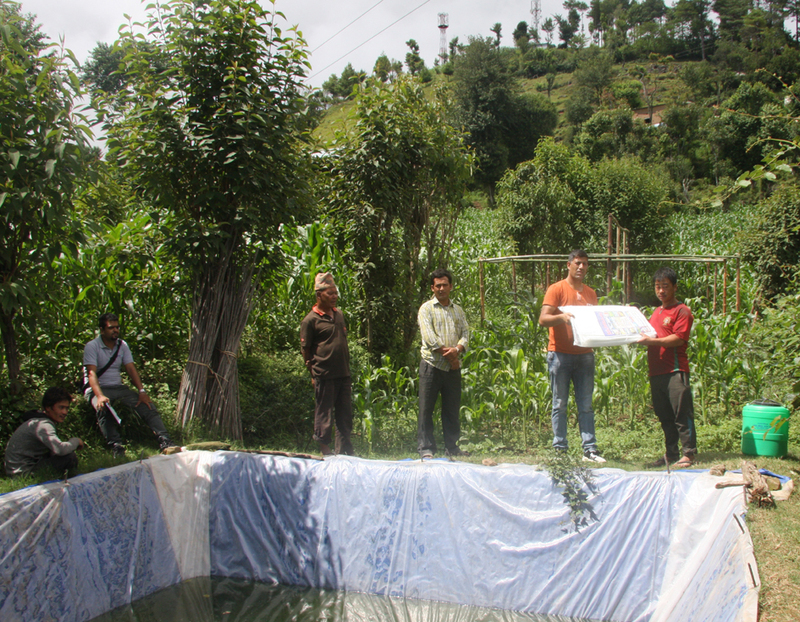 The farmers should take care of the Silpaulin sheets used in the plastic ponds and tunnels. They should be quite attentive that the cattle and children may fall in the plastic pond. It is better to put temporary fence around the pond using local resources such as bamboos and woods. In addition, they can cover the plastic pond from above with bamboos and old Silpaulin sheets or any cheaper materials to reduce any loss from evaporation and to keep it clean. And, they should protect the Silpaulin sheet used in the tunnels from strong wind and snow. They can take the Silpaulin sheets out during the season of strong wind and snow. Proper care of the Silpaulin sheets can increase its life to 7 years. Similarly, the regular cleaning of the drippers, pipes and water tanks increases the life of the drip irrigation kits to 5 years and even more. The only concern is the life of the bamboos used in the tunnel is 3 to 4 years. Hence, the farmers can cultivate high value crops in a large quantity at least for 3 years and cater a high price in the market. Pax Earth President Sujan Koirala distributing a drip irrigation kit and a Silpaulin sheet to a farmer in Kot Timal village. We have designed this project to improve the livelihoods of the farmers surviving from a tough scarcity of water be it for drinking, cooking, feeding cattle or irrigating farmland in Kot Timal village over a decade by providing access to more water. With more water harvested in the plastic ponds, we have aimed to facilitate the cattle farming and agriculture. From the phase-I, the entire 129 families could utilise the plastic pond to sustain cattle farming while through phase-II, we will be supporting the farmers to engage in tunnel farming supported by drip irrigation system. This farming system is an appropriate system for cultivating high value crops in water stricken Kot Timal village. With the little quantity of water, the farmers can gain optimal benefit particularly by producing high value and quality crops in a large quantity even in off-seasons. Due to a budgetary constraint, we could begin with just 10 families so far and aim to bring all 129 families in this project raising the fund gradually. We must wait for 3 months to observe the result of the cultivations. Our effort expects to sustain their incomes by maintaining their livestock, selling milk and high value and quality crops. Through these we expect each family to secure at least Rs. 15000 per month. We hope these opportunities in the village will encourage the youths to embrace farming and agriculture as a livelihood option. Hence, to discourage the youths from migrating to urban areas or abroad in search of an employment is one of the primary objectives of this project. If we did not start this project, the existence of the community people at Kot Timal village would have been at stake just due to the scarcity of the water. In other words, if they could not continue their livelihoods options – agriculture and farming, they would rather prefer to migrate to other villages or cities in search of more livelihoods options. Such instances were very common before we launched the W2L project. 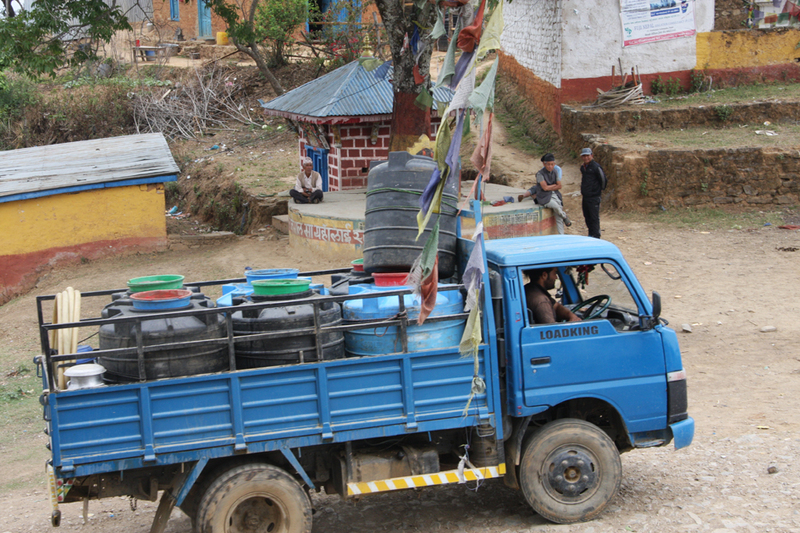 Many community members particularly youths had migrated to Banepa and the capital Kathmandu as they could not afford to live paying a high price for water. Some others were planning to migrate but our intervention influenced to withdraw their plan even though for temporarily. The outcomes of the project will certainly boost their decision to remain in the village till a big on-going (Sunkoshi or Roshi) water lifting project will start operating. But, ‘how many years will it take for the water project to come into operation?’ remains uncertain. We are grateful to local coordinator Dev Raj Khakurel for coordinating the field visit and distribution at the farmland effectively. We are thankful to Rajan Gaire, CEO of Nepal Agro Live Pvt. Ltd. for arranging the 10 sets of Silpaulin sheets and drip irrigation kits on the distribution day. We are thankful to all 10 enthusiastic farmers and their families for their preparedness to attempt tunnel farming with drip irrigation system and for the monetary participation as well. The Pax Earth team led by President Sujan Koirala along with Members Kapil Deuja and Sital Mainali deserves a great appreciation for successfully carrying out the distribution walking to the farmland of each of the beneficiaries from Kalimati through Duee Pokhari. Any person or donor agency interested to extend hands in this project, please feel free to write to sujan.koirala[at]pax-earth.org or soko[at]pax-earth.org.